On 4 June 2006 there was an interesting article on EU Referendum entitled The Jury is still out. Russia allegedly removed Saddam's WMD's. Just as the author of the EUR article I also remember a story about a Russian convoy speeding to the Syrian border, as well as a story on a satelite tracking a 'suspicious' transport which crossed the Western Iraqi border into Syria. Then there is also the Polish Debacle. Initially it was believed that Polish troops found Chemical weapons in Iraq but this was later denied. The Washington Times publised an editorial written by a former Romanian KGB Defector. A third element is the bizarre story of the defected Syrian journalist Nizar Najoef claiming that Iraqi WMD's are in Syria, in De Telegraaf (in Dutch). In fact the EUR Author also indicates that this Russian element starting to come into play more often whilst more and more Iraqi documents are translated. General Al-Tikriti testified in a videotape that Saddam had WMD's and that the Russians helped evacuate it. This was discussed in a conference, as indicated by the EUR author. This videointerview itself shows only the shadow of a uniformed figure talking in English, no visible signs of it being Gen. Al Tikriti. There is also this report and its annexes from the Iraqi Survey Group dated 2004. The key findings summarized in this file. I found Annex F about Chemical and other finds in Iraq, seems to indicate that insurgents used artillery rounds filled with chemical elements in IEDs. Also interesting are the key findings concerning Iraq's 'nuclear program'. Section 20 seems to indicate that Iraq did try to hide its Pre-91 program as best as it could and that components and documents were found in 2003. Russians and North Koreans are also mentioned when it comes to missile technology, the report indicates that Saddam might have attempted to design and construct ballistic missiles with ranges in violation with UNSCR 687. 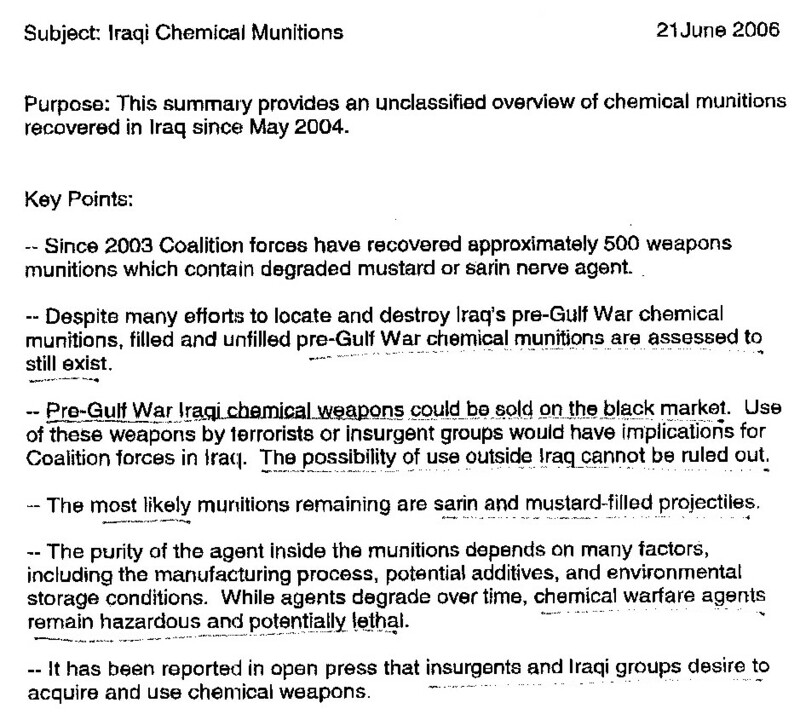 Iraq UN Documents from Global Security. Iraq Special Weapons - Sources database from Global Security. On 29 June 2006 the Intelligence Summit Blog published a presentation by Jill Dekker on the possible impact of Syrian acquisitions from the Iraqi 'Arsenal'. From Lebanon came 2 articles on Najoef's claims this first one with satelite pictures and a general round up of Najoef's claims. What's even more odd is the Sudan connection which surfaced in 2004. Indeed the pressure on Syria concerning Libanon might play a role in the entire situation. So far the Jury is still out indeed but there seem to be indications of Russian involvement, linking it to Syria. Should this surprise us? I don't see why it should. Iraqi planes already went in hiding during the 91 war in Syria and Iran. Moving weapons and technology from Iraq to Syria or Iran is a dangerous move..but if one has nothing to loose. Could the US handle Syria and Iran? I doubt it can handle both on short notice, meanwhile things are brewing in the region.